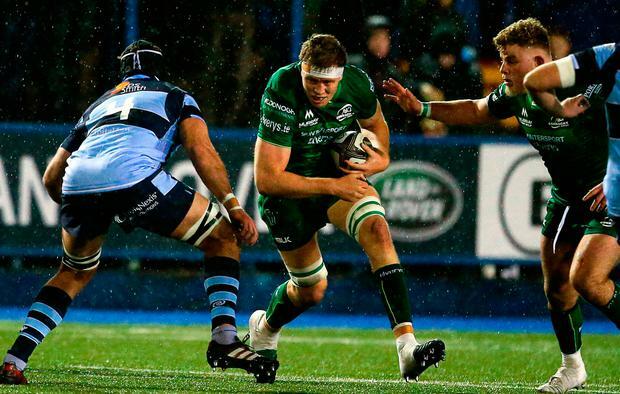 Cardiff Blues picked up an important victory in their quest to qualify for next season's European Cup by defeating Connacht 8-7 at the Arms Park. Very difficult playing conditions resulted in a drab Guinness PRO14 encounter, with Blues having to overcome the loss of two players to the sin-bin and hang on against the elements in the second half. Cardiff's win reduced the gap between them and Connacht to two points in Conference A with seven games remaining, one of which is the reverse fixture in Galway. Owen Lane scored a try for Blues, with Steven Shingler kicking a penalty. Paul Boyle scored Connacht's try, which Conor Fitzgerald converted. Blues dominated the opening stages and were rewarded with the first points when Shingler kicked an 11th-minute penalty. Connacht immediately responded with the first period of pressure and after repeated infringements home prop Brad Thyer was yellow carded. However the Irish were not able to capitalise as they made elementary handling errors and it was Cardiff who had the next scoring opportunity but Shingler was wide with a penalty from inside his own half. The hosts suffered a further setback when they went down to 13 men with number eight Nick Williams sin-binned after flattening an opponent in an off-the-ball incident. The first 25 minutes were featureless but Blues overcame their numerical disadvantage to score the opening try. Their pack of six held firm at a scrum for Lloyd Williams to dart away and feed Lane, who provided a superb finish. Thyer and Williams returned from the sin-bin as Connacht remained scoreless to trail 8-0 at the interval. The visitors had the benefit of the elements in the second half but they could have easily fallen further behind when Harri Millard made a clean break to feed Williams but the scrum-half was hauled down just short of the line. Connacht changed their half-backs in an attempt to bring some impetus to their game but they could make little headway against a resolute home defence in the worsening conditions. The Irish dominated territory and possession but inaccurate handling continued to be their downfall and it was Blues, who had the more penetrative runners with Rey Lee-Lo making a few lively bursts. Replacement Boyle forced his way over from close range with five minutes remaining - but the hosts held on.